You are here: Home » Learn & Live the Faith » Catechesis » Jesus Only? It’s not politically incorrect to believe in God. Just so long as you acknowledge that all are God’s children, and that there are many, equally honorable paths to the Most High. After all, that’s only fair. How conceited it would be to claim that your way is the only way. There is nothing really new about this attitude. In the days of the Roman Emperors, no one had any problems with people worshiping some carpenter from Galilee who they believed to be God’s son. As long as they’d be broad-minded enough to worship the emperor and Jupiter, and the rest of the Pantheon as well. But instead, they believed what Peter proclaimed in this Sunday’s first reading: that there is no other name given under heaven by which we can be saved (Acts 4). Not Caesar, or Jupiter, or Mohammed, or Buddha. For such arrogant closed-mindedness they were thrown to the lions. Does this mean that other creeds have nothing to offer but damnable lies? Not in the least. St. Justin Martyr (d. 165) said that there were “seeds of truth” scattered about in the teaching of the great philosophers. St. Paul honored the Athenians for their pious worship of the “unknown” God (Acts 17). But we are not talking here about bits and pieces of truth, but about eternal salvation. Redemption required more than some good lectures or inspiring quotes–namely, a perfect sacrifice of a perfect life, a life of infinite value. Buddha did not lay down his life for his followers. Neither did Mohammed. And even if they had, they weren’t “savior” qualified in terms of possessing a sinless life of infinite (read divine) value. Only the Word made flesh was qualified, and only he dared do it. He is, as Sunday’s gospel teaches us, the Good Shepherd who lays down his life for his sheep. But he is not exclusivist–his sheep include anyone wants to be one of his sheep, even those who formerly drove the nails into his sacred hands. One sacrifice for all people, for all time. Does this mean that if people haven’t heard of Him and continue to follow Mohammed or Buddha that they are certainly hell bound? Not exactly. 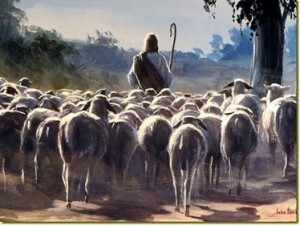 For we are told that there are “other sheep” who do not yet travel with the flock but who do belong to the Shepherd. Responding to the hidden grace of the Holy Spirit, they’ve opened their heart to the truth, wherever it may be found, and seek to do what their conscience tells them is their duty. They may be devotees of Mohammed or Buddha because their hearts have recognized some sparks of truth and goodness in the teaching of those men, and they are hungry for truth and righteousness. If they die good Muslims or Buddhists and are saved, they are saved not by Mohammed or Buddha, but by the only savior, the one who died for them, the unknown God that they secretly sought as they eagerly read the Koran or contemplated the bliss of nirvana. So we should just leave them alone since they’ll be saved anyway, right? That’s not what the gospel says. The fact that it is possible they’ll be saved doesn’t mean it’s a sure thing. The Shepherd wants to feed his sheep with rich fare, with nourishment adequate for the long and arduous journey home. And he wants to protect them from the thieves and robbers waiting to ambush the sheep as they make their way down the road. He can only do this if he can gather them into one flock that he can lead to the green pastures of the Scriptures, the Sacraments, and the rich Tradition of the Catholic Church, the nourishment that makes for not just survival, but an abundant life (John 10:10). So it’s our duty to do what we can to introduce them to the Shepherd and let them know where the best food is to be found.